By Victoria Dwek and Shani Taub C.D.C. 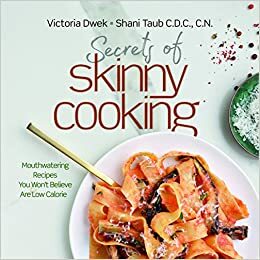 Bestselling cookbook author, Victoria Dwek, teams with successful nutritionist Shani Taub to creating delicious and easy to prepare meals that are low in calories but high in flavor. Eating healthy can be hard and many think, dull. So many tasty dishes we love are usually high in calories. But, did you know that low-calorie recipes can be just as enjoyable as those with lots of calories? With their new cookbook, Secrets of Skinny Cooking (Artscroll/Shaar Press; May 2017/Hardcover), bestselling cookbook author Victoria Dwek and nutritionist Shani Taub show home cooks how to create exciting, flavorful, and filling meals... all for a fraction of the calories they'd typically be. From that moist Corn Muffin for breakfast, to creamy Eggplant Parmesan for lunch, to Sesame Chicken & Lo Mein for dinner... Victoria and Shani have created flavor-filled recipes of favorite dishes all surprisingly low in calories! Whether you've always enjoyed light, healthy eating, or want to lose or maintain weight, Secrets of Skinny Cooking offers more options than you ever thought possible. Why settle for bland dietetic food and restrictive eating plans when you can enjoy Victoria and Shani’s delectable recipes? Powerhouse food writer VICTORIA DWEK is co-author of the bestselling Secret Restaurant Recipes, Everyday Secret Restaurant Recipes, and the popular Made Easy cookbook series. She’s the managing editor of Whisk, a popular kosher food magazine published weekly by Ami Magazine, where tens of thousands of loyal readers turn weekly to her “Hello Cooks” column. She’s a featured personality on Kosher.com, where fans tune into her cooking shows, including the video series based on Secrets of Skinny Cooking. Victoria is also a founding partner of BetweenCarpools.com, the lifestyle site and app for the busy Jewish woman, where she shares inspiration and tips that go beyond food. She holds a B.A. from New York University and an M.F.A. in Creative Writing from Sarah Lawrence College. SHANI TAUB is a certified nutritionist and certified diet consultant who has helped hundreds of patients take control of their weight and start on a new path of health. Based in Lakewood, New Jersey, she counsels patients from all over the East Coast, from Monsey to Brooklyn to Baltimore, and internationally, in Canada, Switzerland, and Israel. Shani struggled with her weight as a child and understands the various challenges faced by her patients who are trying to get healthy. Every struggle is unique and each patient has different triggers that will push them to reach their goal. Working one-on-one, Shani creates a personalized eating plan that fits with that person’s taste and lifestyle. In addition to her renowned weight loss counseling, Shani Taub has also launched a successful line of health foods. As the weather heats up try these delicious and easy low-calorie recipes. Place mushroom caps into a ziplock bag. Add red wine vinegar, garlic powder, basil, and salt. Seal; marinate for 1 hour or up to overnight in the refrigerator. Preheat oven to 400ºF. Place mushrooms and marinade into a baking pan; bake for 25 minutes. Meanwhile, place red pepper into the oven (on its own or in a baking pan). Roast until skin is blistered, about 35-45 minutes. Let cool; peel and discard peel and seeds. Slice pepper; set aside. Coat a sauté pan with nonstick cooking spray; heat over medium-high heat. Add sliced onion; lower heat and sprinkle with salt. Cover; cook, stirring occasionally, until onions are golden, about 15 minutes. Remove from pan; set aside. Coat the sauté pan again with nonstick cooking spray; heat over medium-high heat. Add diced onion; lower heat and sprinkle with salt. Cover; cook, stirring occasionally, until onions are soft, about 5 minutes. Add spinach; cook an additional 2 minutes. Season with salt. the onions. Top with one slice of cheese; bake until cheese is golden and bubbling, 9-10 minutes. Make Ahead: All the components of this dish can be made ahead and stored separately in the refrigerator for up to 1 week. Simply assemble and bake when ready to enjoy. This dish is for those who need their hearty pasta dish. There’s half a serving of pasta in each portion; eggplant stands in for the rest. It’s become one of my family’s all-time favorite pasta dishes, high cal or low cal. Cut eggplant slices into long, thin strips a little wider than your pasta. Place into a colander; sprinkle with salt. Let sit for 20 minutes over a bowl or in the sink; rinse and dry. Place pepper cut side down on a baking sheet coated with nonstick cooking spray; bake until skin blisters, about 40 minutes. Let cool; peel pepper and discard peel. Meanwhile, add eggplant slices to a baking sheet; bake for 20 minutes. Prepare the sauce: Coat a sauté pan with nonstick cooking spray; heat over low heat. Add onion and garlic; sprinkle with salt. Cover pan; cook until onion is soft, 7 minutes. Stir in tomato paste. In a blender, combine onion mixture, red pepper, and yogurt. When ready to serve, coat the sauté pan with nonstick cooking spray; heat over low heat. Add pasta and eggplant strips to the pan. Add red pepper sauce; toss to coat. Season with salt to taste. Serve topped with a sprinkle of Parmesan shavings per serving. Cassandra's Review- The recipes are simple, easy to understand and do not coast a small fortune to create. They can help with everything from weight loss to overall better health and anyone can eat them.